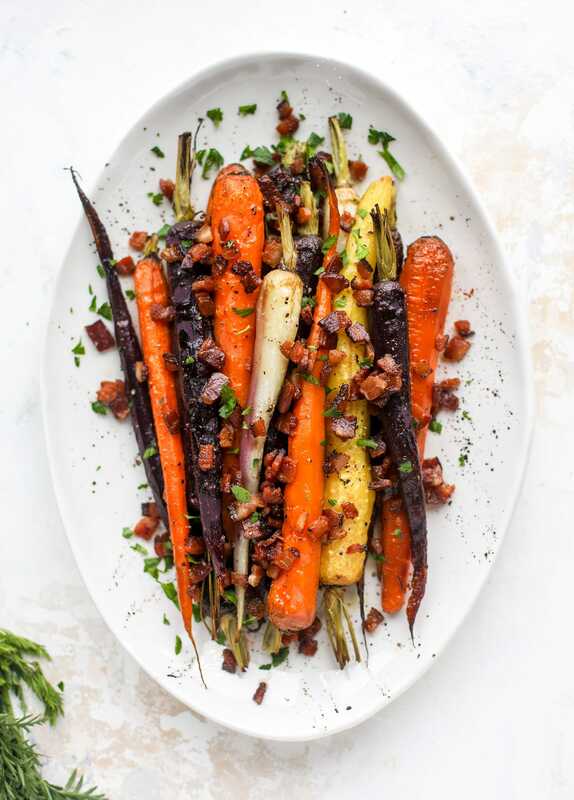 Nothing brings in spring like bacon roasted carrots. Aren’t you so excited too? 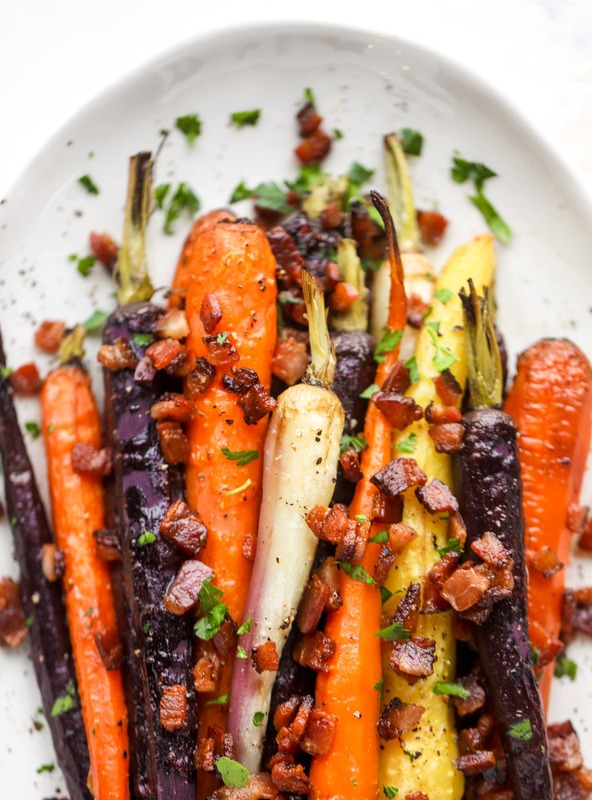 A sweet + savory side dish is exactly what I need. Okay guys. First, I can’t believe I am going to say this, but… this is the recipe that has made me love carrots. In fact, this is the recipe that has made me CRAVE carrots. Second, I could eat the entire contents of this baking sheet for a meal. While carrots seem to be the go-to for kids (they’re sweet! You can dip them in delicious stuff! ), I always loathed raw carrots. If I’m being honest, I still don’t like raw carrots at ALL but I will semi-fake it for my kids. As a result, I find myself not even liking carrots in salad. Unless I spiralize or shave them. Cooked carrots were a different story. I could handle them in soups and stews and if they were served with something else and they were roasted and warm, I was fine with it. But carrots weren’t a side dish my mom ever made for dinner (she was strictly team green beans with almonds with the occasional corn dish) and I just never grew to love them. Meanwhile, I don’t think anyone else in our house liked them either. However! Eddie absolutely LOVES carrots – and he especially loves cooked carrots. I’m always looking for new ways to kick up a carrot side dish for dinners. Because the other thing that you probably already know is that Eddie lives for a side dish. He might enjoy a side dish better than the entrée. He is always VERY interested in the side dish. And that’s how these bacon roasted carrots were born! Salty, crispy bacon. Caramely, tender carrots. There is so much flavor here and so few ingredients! It’s such a winner. I even kind of want to throw these on a salad by themselves and go to town. That would be amazing, right?! 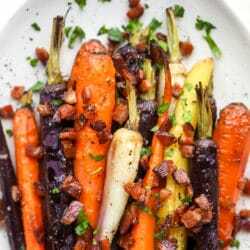 What I love to serve with bacon roasted carrots. This is a simple side dish with loads of flavor, so I find that it complements SO many dishes! Be it meat or veg, this is a great dish to make and one that even tastes great when it’s reheated. 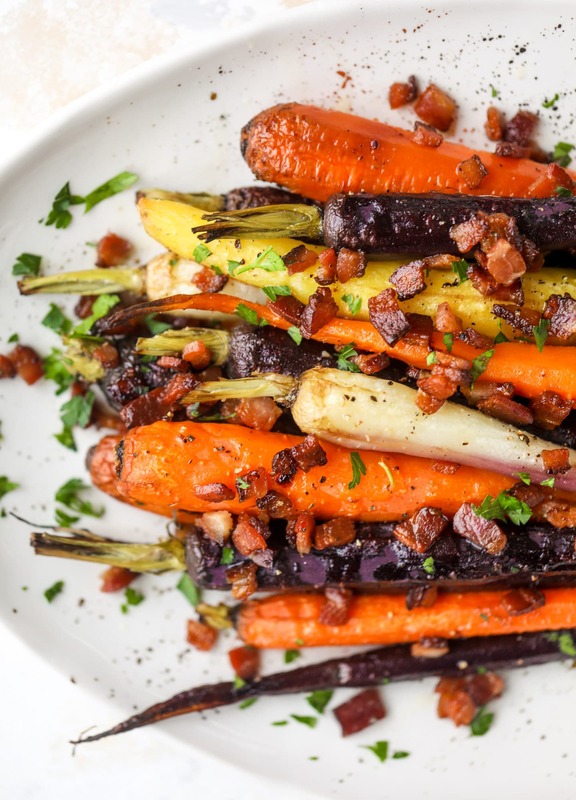 Sweet carrots are drizzled with bacon fat and chopped bacon, then roasted until they are tender, sweet and caramely. So much flavor! Heat a skillet over medium heat and add the chopped bacon. Cook, stirring, often, just until the fat is rendered and the bacon starts to crisp up. Turn off the heat. Peel the carrots and place them on the baking sheet. I like to drizzle the carrots with the bacon grease that is in the pan. Toss the carrots to cover them evenly with the bacon fat. Sprinkle a pinch of salt on the carrots, along with the pepper and garlic. Top with the bacon. Roast the carrots for 20 minutes, or until the bacon is crisped and the carrots are fork tender. Remove the baking sheet and sprinkle with fresh parsley. Serve immediately! These colors give me all the heart eyes. 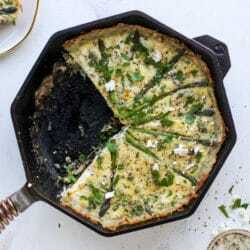 Asparagus Quiche with Hash Brown Crust. I was so-so about carrots growing up. Then I had some at a restaurant owned by a family member of my ex husband. They were SOOOO GOOD! The trick to bring out the natural sweetness? Add some fresh ginger to the cooking water. So simple and make such a difference! I will totally have to try this recipe though. Because…..bacon! that sounds incredible! i’ll have to try. I am very excited to make this recipe. I am a pure vagitarian and it looks healthy. Thanks million. Oh. My. I love carrots from our garden roasted with olive oil and thyme. This recipe looks absolutely amazing because, well, bacon and bacon grease! I can’t wait to do this for Easter Sunday meal – Thanks! thank you so much mimi! I can’t help but lol at “Eddie lives for a side dish. He might enjoy a side dish better than the entrée.” …isn’t he mister vegetables-can’t-be-dinner-I-need-meat? haha, too funny! hahaha soooo eddie actually LOVES vegetables, but he NEEDS meat for a meal. claims that no meal is a real meal without meat. but also wants side dishes. can you say high maintenance? Where did you find the multi colored carrots? I hate carrots with a passion but I’d be happy to cook them for everyone else!! whole foods! however my local grocery store (giant eagle) does have rainbow carrots at peak season! These look amazing. I’d love to make these for a side dish for Passover Sefer next week but, for that clearly no bacon? Any suggestions how to still get that great caramelized flavor without the bacon? amy what if you add some sugar (like honey or maple syrup) and then a few drops of liquid smoke for the smoky flavor?! Jessica, Thank you! I’ll buy liquid smoke this weekend. If I double or triple the recipe, how much liquid smoke and do I add it before roasting? Hey hey! You found me. At the corner of the internet that I've deemed extremely self-indulgent.